Somehow I knew that I would enjoy this book even before I had even picked it up. This hard-cover copy of Ally Carter’s Heist Society had been sitting on Brett’s shelf for quite some time, untouched. And every time I walked by, I saw it in the corner of my eye and said to myself: I really want to read that, some time. And, oh boy, was I satisfied when I did, at last. This caper-esque tale of burglary, blackmail and, most of all, family, ensues when Katarina Bishop is forced to re-enter the family business (of thievery), and embark on a globe-trotting race against time to recover five priceless artworks, belonging to a villain art collector who accuses her father of stealing them. Along the way she enlists the help of her friend, billionaire W. W. Hale the Fifth, Her Uncle Eddie, and her often skimpily-dressed cousin, Gabrielle, as she discovers the secrets behind the historic paintings, and the elusive Visily Romani, who seems to be behind it all (don’t worry, that’s not a spoiler). Katarina—often dubbed Kat, or Kitty Kat, by her relations—is nothing short of intriguing, and has a certain class about her that reminds me of Audrey Hepburn’s ‘Nicole’ from How to Steal a Million; there’s always something greatly riveting about the rich stealing from the rich. In fact, the entire cast of characters seem to exude that high society class by which, I assume, the title earns its pun. 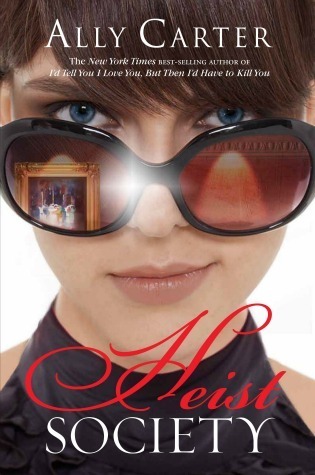 From the U.S., to Italy, France, Poland, England and all the way back again, Heist Society is filled with twists and turns, and thrilling scenes that kept my eyes glued to the page for the few short days it took me to read it. And, gratefully, I was kept guessing till the very end as to how things would turn out for the teenage criminal wonder team. I must also admire Ally Carter for the way she is able to describe the scenery, and the artworks in question; I really felt like I was either strolling down the snowy streets, wandering through the elaborately styled buildings with the characters themselves, or gazing at the very masterpieces she describes (wondrously detailed yet, sadly, fictional). All in all, it’s hard for me to summarise Heist Society without babbling on too much, for—cynic that I am—I find it hard to talk so long in positive phrases without sounding goofy. But nevertheless, let me finish by reiterating how much I enjoyed the fast-paced and dashingly executed caper that was Heist Society, and how much I am looking forward to reading the following instalments in the series. Recommend for people who love excellent teen adventure, but need a break from the sappy-teen-drama. Glad you liked this one, Joey. I have the first two on my shelf untouched too!